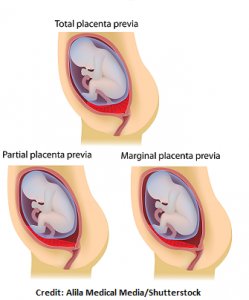 This NCLEX review will discuss abruptio placentae vs. placenta previa. As a nursing student, you must be familiar with these maternity complications along with how to provide care to a patient experiencing one of these conditions. Don’t forget to take the abruptio placentae vs placenta previa quiz. An ATTACHMENT ISSUE!! 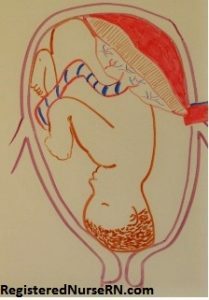 It is the abnormal attachment of the placenta in the uterus near or over the cervical opening. Where should the placenta normally attach? It should attach either to the top or side of the uterus…. NOT in the lower parts of the uterus, near or over the cervical opening. A DETACHMENT ISSUE!! There is detachment of the placenta from the uterine wall BEFORE the birth of the baby. When should the placenta normally detach from the uterine wall? It detaches itself after the birth of the baby because it is no longer needed. The placenta is usually delivered within 10-20 minutes after the delivery of the baby…..learn more about the stages of labor. Types of abruptio placentae include partial or total detachment.